I have mentioned before on this blog about my obsession with skincare, and Eve Lom has been an obsession of mine for the last 10 years. 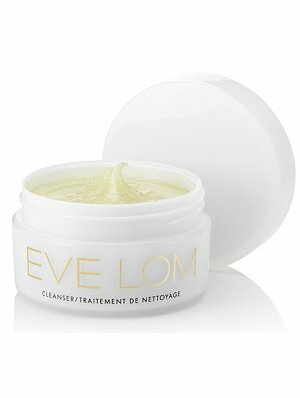 When I was living in London fresh from university, scrabbling around for pennies to make ends meet, I was in a pit of bad-skin desperation, and spent a whopping amount of money on Eve Lom cleanser. A huge extravagance, but I needed a lifeline, and everything I'd read had told me that this was it. And they weren't wrong. In all my trials and experiments of every product on the market, this has consistently proven to give the best results for my spot-prone skin. I won't pretend that it ever cured my full-on acne moments, but it did give a noticeable improvement. If you can buy it in the bigger sizes then do, because it works out much better value. These tubs last a surprisingly long time - you only use it at night, and just use the cloth on its own in the morning. And I don't believe in all that tosh about muslin cloths - a normal flannel will do - the important thing is to wash your cloth regularly. Anyway, a friend of mine, Miss Jones, asked me a while ago about facials, and I recommended (amongst others) an Eve Lom facial. Now, before you get excited, I need to let you know that this treatment is expensive. £90 for the one hour facial at Spa NK. So yes, it's a one-off treat, unless you have some luck with the scratchies. Although in London, for a good facial, I think you'd be hard pushed to find anything much cheaper, and the likelihood of being disappointed is pretty high. So, I met up with Miss Jones last week, and had forgotten all about our facial chat. As soon as I saw her, the first thing I noticed was her skin. Why, Miss Jones, you're looking radiant... She did! Radiant! She glowed! And as the chat went on, she revealed that she had taken my Eve Lom info on board, and been for a facial the week before. Oh my. Didn't she look fine. Not for the faint hearted, the facial involves extraction, and can leave you a little spotty in the week following. But I've seen the results, and it's worth the pain. It's worth knowing that you can use Space NK vouchers at Spa NK, so drop some voucher hints this Christmas, and you too could be Ooh la Lom.